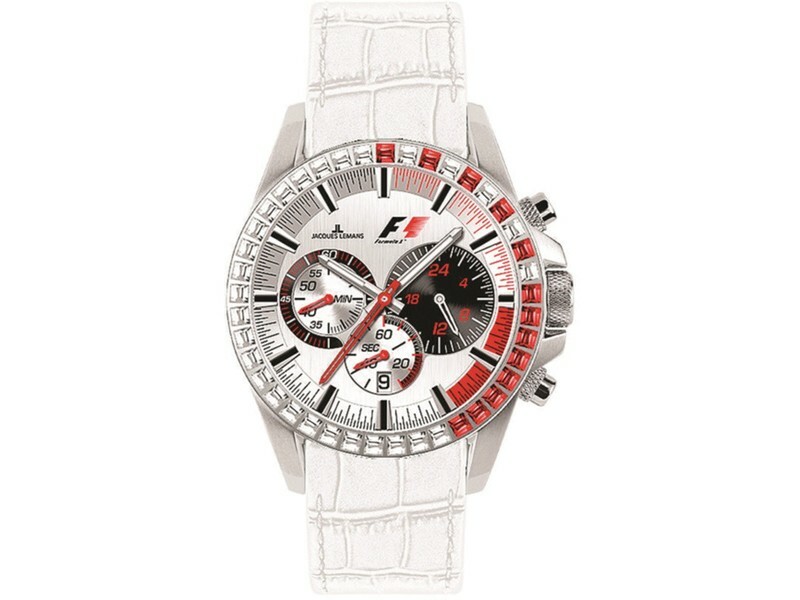 Jacques Lemans # F5006T Red/White Formula One Watch, Stainless steel case with a white leather strap. Fixed bezel set with crystals. Silver dial with silver-toned hands and index hour markers. Minute markers around the outer rim. Dial Type: Analog. Date display at the 6 o'clock position. Chronograph - sub-dials displaying: three - 60 second, 60 minute and 24 hour. Quartz movement. Scratch resistant crystex crystal. Case diameter: 36 mm. Case thickness: 13 mm. Round case shape. Deployment clasp. Water resistant at 100 meters / 330 feet. Functions: chronograph, date, hour, minute, second. Dress watch style. 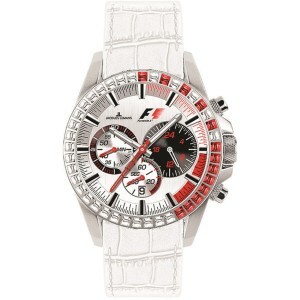 Jacques Lemans Formula 1 Silver Dial Chronograph White Leather Ladies Watch PF-5006T.